Being a son of Poseidon has its own perks and benefits and Tyson may as well put that to use. 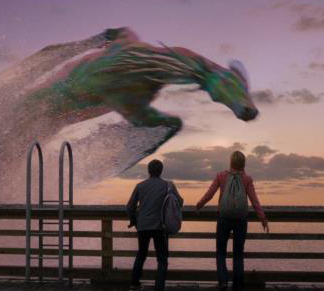 In the latest Percy Jackson: Sea of Monsters movie clip, Tyson finds a solution to their water-travel problem by employing the help of a Greek mythical creature called the hippocampus, especially named Rainbow. Riding a hippocampus is very well a new experience for Percy Jackson. How glorious could that be? It's not everyday that you get to see mythical creatures in the real world, much less go have a ride on one of them. In short, I am simply jealous of the experience. I hope they make a Percy Jackson theme park just like that. Here's another clip that might get you excited on your seats. Percy Jackson: Sea of Monsters is now showing in theaters near you.